I first saw one of these at a friend's house in early November 2004. She explained that a friend of *her's* saw them at a craft faire, duplicated them at home and gave one to my friend. My friend then hinted VERY broadly that it would be really nice of me to make one with new Zundt alphabet designs that I had just bought. 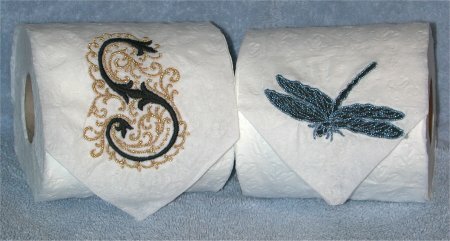 :-) When I returned home to California, I actually made two TP rolls for my friend .. one with the Zundt Design alphabet ("S" for their surname) and a freebie dragonfly to coordinate with their guest bathroom's motif of dragonfly designs. No, you don't really USE the embroidered TP!! It's just a 'for pretty' item. The initial is a commercial set from Zundt Designs and is their "Classic" alphabet. Zundt Designs are pricey, but they are absolutely drop-dead gorgeous. The level of detail is astounding, even in the smallest parts of their designs.